The round brilliant diamond has become a worldwide favourite and probably one of the most popular diamond cuts ever. 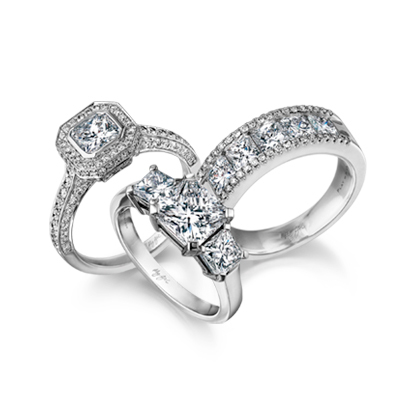 The traditional diamond offers a style that never goes out of fashion, making it ideal for engagement rings. The beautiful ring represents personality characteristics such as warmth, empathy and dependability. The most popular of all the diamond shapes, the round brilliant cut diamond is coveted all over the world. A traditional favourite for engagement rings, the round brilliant cut diamond offers timeless beauty, that never goes out of style. Its history dates back over a century, and it is still as popular today as it was when it was first designed. Today, the round brilliant cut diamond accounts for more than 75% of all diamonds sold worldwide. Polished to ideal proportion and symmetry, round brilliant cut diamonds radiate with optimum fire, brilliance and scintillation. This cut is often called an “open” cut as it allows maximum light display and sparkle. The cut is optimised for light refraction: light enters the crown of the diamond, and the maximum amount of light exits the crown. The ideal proportions for a round brilliant cut was developed by Marcel Tolkowsky in 1919. Tolkowsky wrote a thesis that described the ideal proportions of a round cut diamond in order to maximise its light return. His specifications were followed for years. Diamond cutters and craftsmen have since spent decades perfecting the round brilliant cut diamond to what it is today. They use advanced scientific theories of light behaviour, optic dispersion and geometry to determine the best shape and optimum number of facets required for the diamond to produce maximum brilliance. The round diamond is cut to produce a round shape when looking down through the table. The modern cut consists of 57 facets. The Crown consists of 1 table facet, 8 bezel facets, 8 star facets and 16 upper girdle facets - a total of 33 facets altogether. The pavilion consists of 16 lower girdle facets, 8 pavilion main facets and 1 culet. This popular shape is cut to bring about a tapering pavilion, a round girdle and a tapering circular crown. The round shape has been linked to the personality characteristics of warmth, empathy and dependability. It is also a popular shape because it flatters all finger lengths and shapes. The symbol for eternity, completion and ‘forever,’ the circle has a long-standing history as a meaningful representation of the promise of a lifelong love and commitment. The round, circular shape of the round brilliant cut diamond is thus a perfect representation of a promise of commitment, making it ideal for an engagement ring. For those seeking absolute perfection in every facet, consider the patented Brilliant 10 cut diamond which is also round in shape; or Eight Hearts diamond; a true Hearts and Arrows cut.